Oyokey is a cloud-based Addressing and Recognition Technology company based in Irving, Texas. Oyokey’s mission is to flatten the Internet information architecture and organize the Web, making it truly accessible and useful via Mobile devices, Emerging devices and Voice-based platforms. At Oyokey we are re-inventing the way information is addressed, accessed and presented. Every industry has to innovate to survive. The Naming industry is no exception. A much hyped innovation in the Naming world has been the development of the New Generic Top-Level Domains (ngTLDs). Some examples of the hundreds of ngTLDs are .pizza, .rip, .bingo, .directory, .wed, .casa, .software. No one should have a problem with this development, right? Well, not so fast. Let us look at this perspective first, the founding fathers of Internet Addressing and Naming did not see auctions or cybersquatting as successful forms of business or revenue model for the Domain industry. These were just outcomes. For them, the goal was simple, addressing and accessing using truly generic TLDs based on Keywords that were broad enough to include the entire spectrum of business and personal entities. So we can argue that ngTLDs are not generic enough. It is obvious that ngTLDs have to be meaningful and of value for everyone within the ecosystem. From what is being observed today, it has not been smooth sailing for ngTLDs as it was for traditional TLDs such as .COM and .NET over the last few decades. 85% of the market is still dominated by .COM and .NET, something that the ngTLD Registries would love to achieve. Was it wise to go beyond the traditional TLDs? Did the market really need hundreds and potentially thousands of additional ngTLDs or was this a move to milk more registration dollars from domain owners? Our view is that the ngTLD program creates the effect of diluting brand names, more so for existing Domain Name customers. The ngTLD program is bound to create more auctions, bidding and trademark wars. This benefits only a few Registrars, Registries and individuals trading in re-sale of Domain Names. What is interesting to see at NamesCon, a top domain industry event, is the extent of involvement of new Registries, Registrars and individuals in the bidding and auction of these ngTLDs. a Keyword as part of a TLD is being rejected by members of CRIDO and others who face millions of end users on a daily basis. ICANN ignored requests by thousands of major players and agencies to stop promoting a product that dilutes brands. Unfortunately the ngTLD program’s can of worms is now open knowledge and a disaster that cannot be fixed. We have aggrieved parties from Retail to Government to Advertising to Attorneys. An even more disastrous scenario is ICANN and the Naming Industry retracting the roll out for the ngTLD program. The most ICANN can do to mitigate this is by not creating more TLDs using Keywords. The silver lining in all of this is that market forces will ultimately prevail and shape the future. The absolute failure of some ngTLDs will not be a surprise at all. Although some ngTLDs will establish recognition and find success, their sites might not meet the utility of a .COM .CO or .NET. The current prediction in the market is that most of the ngTLDs will fade out from lack of response or appetite for consuming multiple Domain Names. The other way for this program to be successful is if the likes of Google are developed using a ngTLD, not just renaming an existing Google with a shell like abc.xyz. That is more of a challenge than anything. Try convincing successful startups to re-brand their website with anything more than a .COM or .CO. For most existing owners who already have a .COM or .CO, the shakedown or fear of their brand being hijacked by a ngTLD will not be enough to add the expense of buying multiple ngTLDs. We at Oyokey, fully understood that the appetite for Keywords to represent the company brand is justified even before the ngTLD program was rolled out.The form factor is very important when it comes to Internet Addressing; so inserting these Keywords at a TLD level may be an overkill. Let’s say Sal’s Bistro owns salsbistro.com and they sell great pizza, therefore they buy the domain name, salsbistro.pizza. However, they are also known for great coffee. 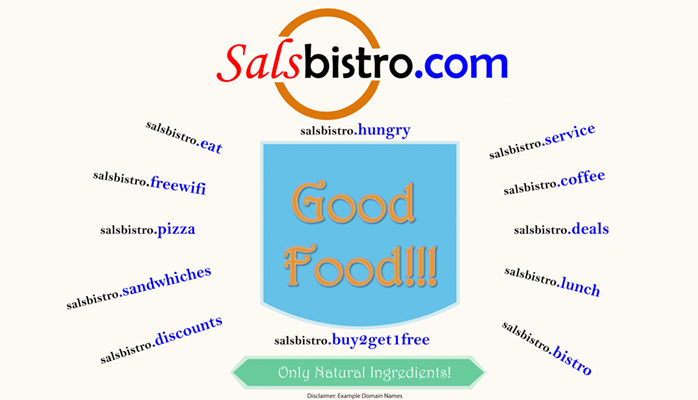 Should they now buy salsbistro.coffee? Now let’s say they are from New York, so do they buy salsbistro.nyc? Which domain should they buy and promote? ngTLD is like a tattoo, once you get one, soon you want another, and then another. It’s hard just to have one tattoo. Unfortunately Naming and Addressing will fail with too many identifiers. TLDs such as .COM, .NET or .CO avoid specific Keywords and their neutral nature is what made them scalable and easy to use. These Keywords are truly generic. Hopefully the ngTLD program may not turn out to be the Domain industry's achilles heel. Only time can tell. Disclaimer - We are not currently associated with any Domain Registries or Registrars. We genuinely believe in the potential of Naming and we promote the purity and value of Naming and Addressing; how the Naming industry has shaped the Internet and made it a success. We believe that the ngTLDs are a dilution of existing Domain owners’ brands. ICANN should stop rolling out ngTLDs that they call generic but are actually specific Keywords that belong to an industry, city or business. Examples used here are used as such - examples. We believe that Naming and the Web have to be part of the narrative in the future since they have made the Internet into a democracy where everyone is allowed to participate in this open standard which is not proprietary or a closed system. What is the future of Recognition Technology? Copyright © 2013-16 Oyokey Inc. Simple theme. Powered by Blogger.